Earlier this summer, a press event held to celebrate the tenth anniversary of the North Loop Theater District turned into something of a love-fest for Mayor Daley, when theater insiders lavishly praised him for having the vision and fortitude to push to make the district a reality. Then the mayor himself spoke passionately about the role of arts in the life of the city, and in education in particular. I left the event stunned, and maybe a little embarrassed. I live in Chicago and edit an arts and culture weekly, but somehow never keyed into the mayor’s deep passion for the arts or his view that they were so central to his dreams for the town he loves. In retrospect the evidence is everywhere. Why is it that I, a long-term Chicago resident, don’t really know the big picture of our mayor’s priorities in managing this city? What the mayor needed, and the public needs to read, I thought, is a mission statement, an articulation of his vision for the present and future of Chicago. Not long after this event, Richard M. Daley made the surprise announcement that he would not seek another term and I started thinking about the question, If I were mayor of Chicago, what would my vision for the city be? I’m not running, but I sure would like a candidate who thinks like me. We will elect a new mayor for the first time in decades next February 22. Expect the press coverage of the race to resemble the sports pages. Most will focus on who is favored, who might pull an upset. Politics as sports, politics as cult of personality. Is Rahm really that cranky and foul-mouthed? Can James Meeks be elected with the first name Reverend? Expect, too, much discussion about race. 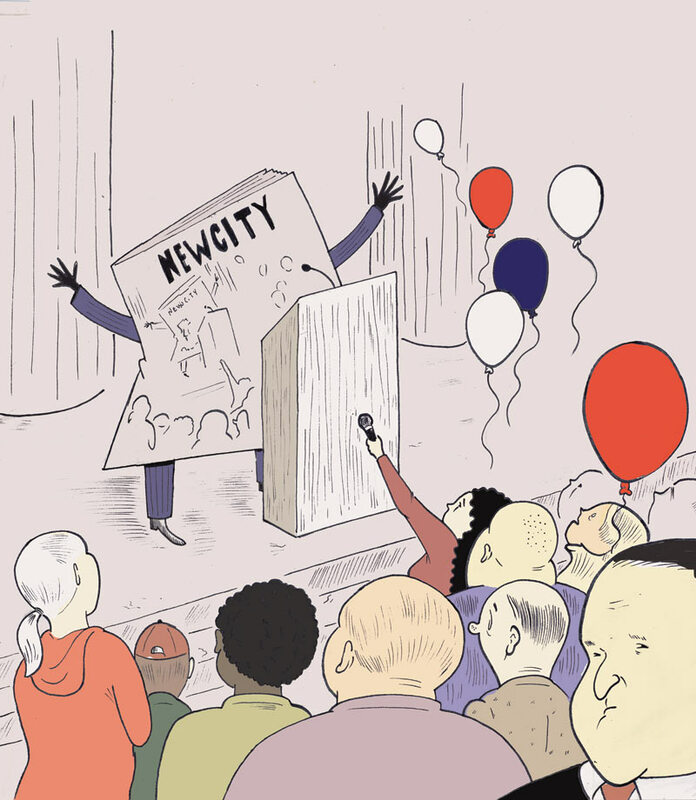 Racial coalitions, and sub-coalitions—African-American, Latino, white—will be bandied about and I suspect there will be little pretense that we, as a city, can transcend race as an issue. The media won’t let us. But think about it. You might have a take on the personality of Rahm Emanuel, but can you name one thing he would like to do as mayor? Not likely. What we need is a little, no make that a lot, of vision. Here’s a start. The Arts: People may move to a city for a job, but they stay for the culture. A tourist will visit Chicago once to summit Willis Tower and eat funnel cakes at Navy Pier; they’ll come back every fall to see theater. The arts in Chicago are better than ever. It is critical to continue to build on our success, especially in challenging economic times, when culture can be painted as luxury. It is not: it is essential. It is the wellspring of our collective creativity, the forum for our humanity. It’s what makes us a world-class city. The city can do more to make the economics of arts production as alluring as possible. It can cut fees and regulations to help spur new work in theater, film and arts-related entrepreneurship. Chicago can even help underwrite arts-incubator projects that seed economic development in areas that can use a kick-start. The arts thrive in unconventional places and the city can be proactive in making those venues possible when rules make them improbable. The arts in education must be a priority on par with reading, writing and arithmetic, and nonprofits who augment this mission, whether After School Matters or Young Chicago Authors, need a steady flow of real and emotional support. Research supports the idea that arts promote lifelong health and professional success: is there a better goal for education than this? Restaurants & Nightlife: Nightlife is essential to a city’s joie de vivre. Clubs and bars support the bulk of the musical arts, both live and DJs, and most are small businesses that employ our friends and neighbors. Blues, jazz and house music came of age in Chicago nightclubs and spread out to change the world. The neighborhood watering hole is a real, terrestial social network at a time when most of those exist only in the nebulosity of cyberspace. License them, regulate capacity, inspect safety and even create special nightlife zones where larger clubs are encouraged to situate, but don’t shut them down, don’t reduce the number of liquor licenses in the city, and don’t make their existence seem capricious, lest vagueness foment the corruption that too often plagues their environs. Our dining scene is now world-class, and the foot soldiers of revolution are breaking down the barriers to the thriving mobile cuisine (i.e. food trucks) that are invigorating so many other cities right now. Tear down antiquated practices that block innovation and creativity. Active Transportation: A densely populated city core is a great city, one that thrives with restaurants, nightlife and shopping. But it is not a great place for cars. The need to reduce residents’ reliance on automobiles has never been greater. Walk, bike, take the CTA: each of these options increases health, reduces congestion, improves the environment and reduces our nation’s reliance on foreign oil. Encouraging public and people-powered transportation goes far beyond a pep talk: the city must pursue policies to encourage citizens to move in this direction. Trains and buses need to be safe, frequent and reach all areas where an appropriate number of people want or need to go. GPS tracking of buses and trains are a great move in the direction of making the system user-friendly; now resources need to flow into improving the quality of stations and the frequency and reach of service. Fare hikes and service cuts, which demotivate ridership in favor of cars, must be poison. In addition to making the CTA a better alternative, create safer biking lanes that cars cannot trespass and enforce laws that protect pedestrians. Drivers who casually run red lights, violate crosswalks and yak on their phones while narrowly missing pedestrians are a scourge on the city. And make sure that real estate developments of any sort, whether public or private, prioritize pedestrian and bicycle access. For a long time, improving traffic flow for cars has been the highest civic priority, often at the expense of those not in cars. Change it. Job creation: Jobs, or their absence, are the movers of people into or out of the city. Even in flush economic times, the mayor needs to be focused on this issue with the greatest intensity, as it will provide the tax revenues and stable residential base that feeds all other initiatives. While it’s great to land, or retain a Fortune 500 headquarters, their pursuit is a bit like trying to sign LeBron James in free agency. The price extracted offsets much of the economic gain in doing so. Better to cultivate the seedlings of industry, the high-school LeBrons, in hopes that planting a field will yield some very sturdy plants. This means paying careful attention to small businesses sprung from native soil and their contentment, especially those poised for rapid growth like, most famous recently, Groupon. At the same time, we must be sending sales representatives out to other markets where successful startups are plentiful, in order to pitch them on the virtues of setting up shop in Chicago. Technology: Twenty-first century job creation means evangelizing the value of technology. With the University of Chicago, Northwestern and the University of Illinois in the region, we have some of the finest research minds in the world in our backyard. But too often their progeny decamp for Silicon Valley and the like, without a sense that we value their presence and will aid their development. The mayor must work closely with these and other universities to stem the brain drain out of the region and to encourage a fast-paced spirit of entrepreneurship. The mayor should develop a council of technology advisers, made up of academic leaders, business leaders and scientists to both develop policy but also to mentor the best and the brightest. Top business schools, like research universities, are hotbeds of entrepreneurial innovation and should be actively cultivated as potential local businesses. Too often, students incubate ideas while completing MBAs at the likes of the University of Chicago Booth School of Business (where there is an active venture incubator on campus), and then flee for the coasts when or even before they get their degrees. We have the upper hand when they are studying here, and we should play it. In the same way, the city must set up small-business incubators, encourage their development in private hands as well, and monitor their participants’ progress in order to help them graduate into larger employers of Chicagoans. Education: Talk to anyone who moves out of the city and into the suburbs and invariably public education is the driving force. While we’ve made great strides these past ten years or so in creating terrific public magnet high schools for our brightest students (so much so that only a fool would take a smart kid out of the city), the neighborhood kids still suffer. It is easy, and in vogue, to blame teachers—easy but wrong. There are lousy teachers, sure, in public and charter schools, even in private schools. But the problem is much bigger than teachers. It starts and ends at home, where a fractured or dysfunctional family gets manifested in a disregard for the value of education. Schools need resources and a broadening of their mission to help prepare young people for a multinational, technology-driven world that did not exist when we were young. Education will never work until students see its value in their lives, in getting ahead. Market-based incentives, like vouchers, fall short when those purportedly incentivized are not interested in what’s at stake. And the city needs an evangelist to sell this idea, not only to the kids but, just as important, to the parents. When this happens, even mediocre schools are likely to spring back to life as disillusioned educators see signs of new hope. Landmark Preservation: Chicago is world-renowned for its architecture, and the very spirit of its history is captured in its old buildings. Identifying and preserving landmarks, including those of a more recent vintage than the “first wave” of buildings protected, is a critical issue for the city. Real estate developers, with flush campaign-donation coffers and friends in high places have long had the upper hand over the silent wails of vintage brick and mortar, but as long as the city is populated with so many unused, or underused lots, energy should be channeled toward more efficient use of land from the public’s standpoint. It may take the finesse of an NFL general manager to engineer the trades and deals sufficient to respect the economic interests of developers while protecting the public interest, but so be it. Parks: The city’s parks are the mixing bowl of democracy, the antidote to obesity, the beauty mark on the face of a supermodel. We need to protect and improve our existing parks with voracious intensity and we need to expand their footprint at every opportunity, especially as new neighborhoods blossom around the town. We need to protect and expand the lakefront, our city’s most precious public asset, whether by continuing to develop Northerly Island as a newly public resource, or by expanding the lakefront’s path through the “last four miles” currently vested in private hands. If crime and poverty are not related, why do they live in the same neighborhood? Poverty Intervention: Cities like Chicago have long suffered the powerful wound that poverty inflicts, both on the soul of its residents and on its manifestations in crime, social services and education. The social-welfare safety net needs to be preserved, especially now, but active programs to move folks off of welfare and onto employment rolls must be cultivated. Though most of the programs and funding for welfare come from federal and state coffers, most of their recipients dwell in cities such as Chicago. For three decades, the war on poverty has been more like the Cambodian airlift, as America has attacked its welfare state without developing a cohesive alternative. Given the state of affairs in Washington and Springfield, we can’t expect much change in this regard. Chicago’s mayor must lead the way. Crime Reduction: The best way to reduce crime is to prevent it, and the best way to prevent it is by attacking its economic sources. But we can’t be Pollyannas: crime has flourished as long as we’ve had cities, and will continue to do so as long as we exist. Police forces must be maintained at current or higher levels, with a continuing emphasis on community policing in the most crime-plagued neighborhoods. Beyond this, we need a cultural shift in our policing mission. Just as our soldiers in Afghanistan see their mission as winning over the hearts and minds of civilians, so too do our police need to change their cultural focus from confrontational to cooperative. Budget Management: The city is a very large entity with relatively fixed costs and highly uncertain revenue streams. Operating it is a complicated affair, made all the more complicated by the unique character of public employment where some jobs exist not to fill a need, but to keep money in the pockets of sympathetic constituents. A patronage army is an expense we cannot abide in these economic times, and increasingly scarce resources must be deployed to their greatest and most productive potential. Public employees must be compensated in methods commensurate with what their peers in private enterprise receive, both in wages and benefits, including retirement plans. We cannot morally change the terms of retirement for those already or nearly retired, but we cannot economically sustain a system of unfunded pension mandates into perpetuity. Defined-benefit pensions disappeared from the corporate landscape in the late eighties, conveniently after takeover artists discovered they could be raided and plundered in good times through accounting mojo; ironically, much of the same mojo was used to underfund public pensions these past decades and put us into one fine mess. The upshot? Adults cannot be trusted with access to money without recourse, and defined-benefit plans too easily fall into that scenario. Reduce the size and complexity of government: What, exactly, does Cook County do that Chicago does not? Why fifty aldermen in Chicago? Every elected government official, every governing body, comes complete with a costly infrastructure to perpetuate its existence. Many of these bodies were created when the fastest way to communicate was the mail, and the fastest way to travel was on horseback. Times have changed and so too should the structure of government. Could Cook County be merged with the City of Chicago? Whose tears would be shed? Marketing the city: For all our troubles, it’s never been a better time to be Chicago. The city is beautiful, our artistic life is thriving and our streets pulse with more and more activity. Yet we still fret about Al Capone as our worldwide symbol. It’s time to forget ol’ Scarface and to market ourselves like the multibillion-dollar institution we are. (Chicago’s $6.15 billion revenue forecast for 2011 would put it at about number 353 on the Fortune 500 if it were a private company. Using five-to-seven percent of revenues as a rule of thumb for those companies, that would imply spending more than $300 million on marketing.) We need to market to tourists, US and worldwide; we need to market to potential residents, US and worldwide; we need to market to prospective businesses, US and worldwide. And we need to tell them the weather really ain’t that bad. (What good is marketing, after all, if it doesn’t exaggerate just a little bit?) And we need the city to market to us, its citizens. We need to know what and why it does what it does; we need to know when and where its magnificent cultural activities are taking place, we need to know our votes, and our money, are well spent. Transparency might have been a great concept once, but with the internet there’s no excuse for it not being a reality. The mayor needs to be more than an accomplished technocrat. The mayor needs to lead the city, and the nation, on broader issues, like immigration. With a city fueled by so many successful immigrants both now and in its past, the mayor of Chicago needs to become a vocal player in developing immigration policy, to serve its specific interests but also to offset the less-reasoned efforts being deployed at the gubernatorial level in many states. The mayor needs to lead on social issues, such as gay marriage. Gay marriage is a civil right, not a religious issue, as long as legal and social institutions create special preferences for married couples. It must be legalized. The mayor needs to exemplify citizenship in the city at large. We need to see the mayor out and about, being a Chicagoan. We want to bump into him at a Sox game (let’s hope that the next mayor perpetuates that thread of enlightened fandom in higher office); we want to see him riding the el. We need to know he knows what we know about our streets and town. And we want him to be a dreamer, to imagine an underused patch of land might be a Millennium Park and have the tenacity to bring it to life, even in the face of ruthless dissent. You’ve seen ours, now show us yours as the conversation continues.